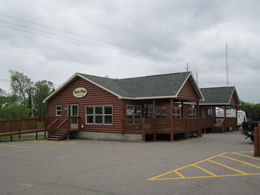 Roth RV and Marine is located in Deerwood, Minnesota on Highway 6/210. Get Directions. We are the low price leader for RVs, Cargo and Utility Trailers, Fishing and Pontoon Boats and Trailers in Minnesota. Folks come from all over the state, and out of state, to buy from Roth RV and Marine. And, we deliver nationwide. Roth RV carries a large inventory of towable RVs including Travel Trailers, Fifth Wheels and Toy Haulers from Forest River RV and In-Tech RV. We also carry Ice and Fish Houses, Pontoon and Fishing Boats, Boat Trailers, Boat Docks and Lifts, and Enclosed Cargo Trailers and Open Utility Trailers from major brands including Yamaha G3, SmokerCraft, Sunchaser, Forest River, Ice-Trek Continental Cargo and more. We even carry trailers to carry your jet ski and snowmobile, and outboard boat motors. If you can tow it behind a truck or SUV, chances are you'll find it here at Roth RV. For more information about our products and inventory, please Contact Us or call us in Deerwood at (800) 837-5506.